Quite famous in Tamilnadu, originally called 'Vatral' or 'Vathal' kuzhambu which is framed to VathaKuzhambu. This is usually made with Sundakkai vathal (Sundried turkey berry) or manathakali vathal (Sundried Black Nightshade) .. This is also made with fresh vegetables like Brinjal/Ladies finger/Pumpkin/Sweet potato etc. Once done, add the sambar powder/red chilli powder to the oil. Saute 2-3 seconds. The powder will get fried in the oil and immediately simmer and add chopped ladies finger. 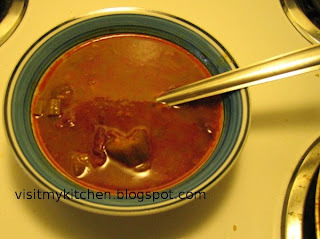 The adding of sambar powder/chilli powder to the oil beforehand will add nice color and taste to the dish. Saute the ladies finger for couple of minutes. Serve hot with rice, will also go good with curd rice.